The human flea, Pulex irritans, is a cosmopolitan flea species that has, in spite of the common name, a wide host spectrum. It is one of six species in the genus Pulex; the other five are all confined to the Nearctic and Neotropical regions. The species is thought to have originated in South America, where its original host may have been the guinea pig or peccary. 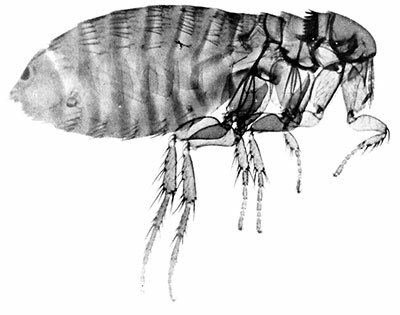 Fleas are a pest species to their hosts, causing an itching sensation that results in discomfort and leads to scratching in the vicinity of the bite. Flea bites generally cause the skin to raise, swell and itch. The bite site has a single puncture point in the center. Bites often appear in clusters or small rows and can remain inflamed for up to several weeks. This species bites many species of mammals and birds, including domesticated ones. It has been found on dogs and wild canids, monkeys in captivity, opossums, domestic cats, wild felids in captivity, chickens, black rats and Norwegian rats, wild rodents, pigs, free-tailed bats, and other species. It can also be an intermediate host for the cestode Dipylidium caninum. Fleas can spread rapidly and move between areas to include eyebrows, eyelashes, and pubic regions. Hair loss as a result of itching is common, especially in wild and domestic animals. Anemia is also possible in extreme cases of high-volume infestations. People in close contact with very sick pneumonic plague patients may be evaluated and possibly placed under observation. Preventive antibiotic therapy lmay also be given, depending on the type and timing of personal contact.